We hear about “sharia law” all the time in the news these days, but what would it really be like to live under it? 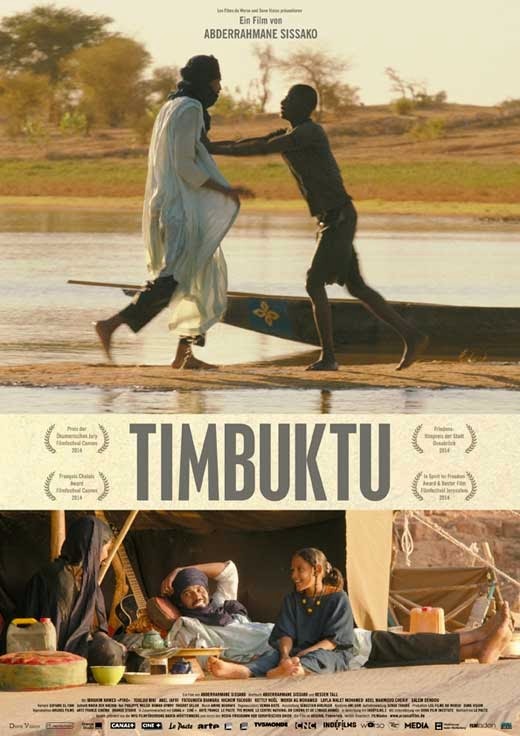 Based on the real occupation of the titular locale that lasted a year starting in April of 2012, director/co-writer Abderrahmane Sissako's TIMBUKTU suggests it would be a mixture of comic absurdity and medieval horror. Armed jihadists with bullhorns make pronouncements that, “smoking is forbidden, music is forbidden, women must wear socks and gloves.” It only gets more draconian from there, with people forbidden from even sitting outside their homes. Football is banned, too, forcing a group of children in one of the film's more lighthearted moments to play soccer with an imaginary ball. In the wake of recent attacks by ISIS, which bear some similarity to what takes place in TIMBUKTU, some people ask, “where are the moderate muslims?” Here, they are the ones being oppressed. Even the town's religious leader is not immune from harassment, his comments that, “in Timbuktu, he who dedicates himself to God uses his head, not his weapons,” falling on deaf ears. In the midst of this, Kidane (Ibrahim Ahmed) his wife (Toulou Kiki) and their twelve-year-old daughter, Toya (Layla Walet Mohamed), live in a tent outside the main village and raise cattle. One of his neighbors is a fisherman, upset that Kidane's cattle often interfere with his nets. One day he shoots one of Kidane's animals, and when Kidane goes to confront the man, a struggle ensues. Kidane has brought his gun with him for protection, and in the struggle it goes off, most likely accidentally. Kidane makes no real efforts to escape justice, and is told by Abdelkerim (Abel Jafri), the leader of the jihadists, that he must either come up with 40 cattle to give to his victim's family as “blood money”, or pay with his life. As much as we care about this central story, it is by no means the whole film; merely the more traditional plot that anchors it, and allows it to tell other tangential tales of the occupation. And as the film goes on, the effects of that occupation get harsher and darker. A musician is publicly lashed 40 times for singing, and another 40 for having a male accompanist in the room with her. We also see a couple buried up to their necks in the sand getting stoned for adultery. And yet it's perfectly okay for one of the soldiers to take a village girl as his wife against the objections of her mother, the occupiers finding justification in the Koran. The Jihadists are clearly the villains here, and rightly so, but the film never portrays them as foaming at the mouth maniacs. They are humans, flawed as all humans are, doing what they believe to be right. Not surprisingly, even they can't live up to their own standards of Islamic perfection, as we see when the film catches Abdelkerim sneaking a smoke behind a dune. The difference is when he slips up, there's no one holding a gun to his head. There's so going on in this film thematically and plot-wise, I almost neglected to mention how good it looks thanks to Sofian El Fani's cinematography, or how good the ensemble cast is. Sissako also has a knack for composing great, understated sequences that don't shy away from showing violence and brutality when necessary, but don't wallow in it, either. And as much food for thought as the film offers, it also functions perfectly well as an engaging drama that should be accessible to audiences provided they aren't hung up on subtitles. 4 out of 4 stars.